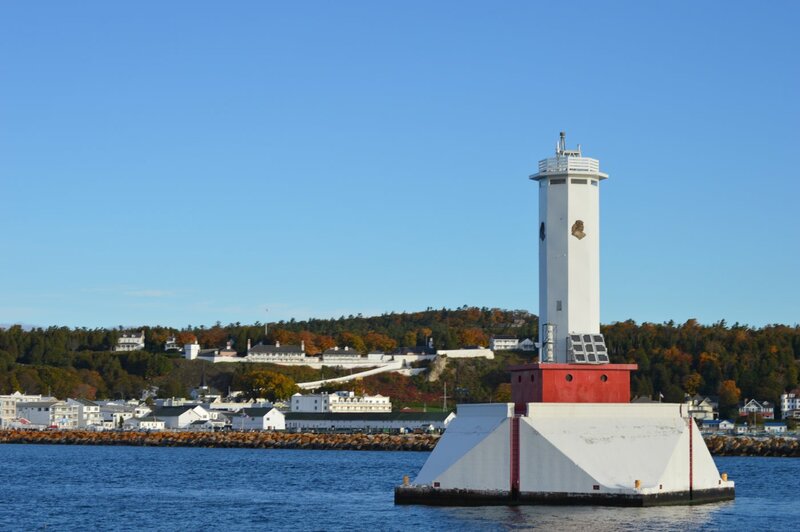 Round Island Passage Light and the Mackinac Island harbor in the fall. 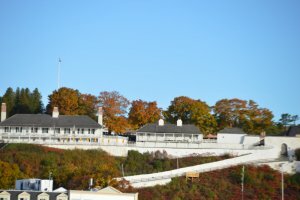 While we don’t see extreme heat during most of the summer months, there is nothing better than the feel of a cool, crisp autumn walk on Mackinac Island. When the sun is shining, that just makes it even better. Cooler temps mean you don’t get hot while riding your bike around the Island, and the aroma wafting through the air is more fudge than anything else. 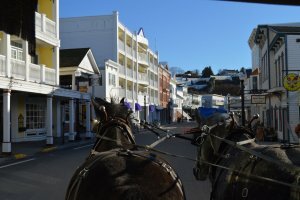 If crowds are not your thing, fall is the season for you on Mackinac Island! There is plenty of room to walk on the sidewalks and ride your bike down Main Street. There is less of a wait at your favorite restaurant and fudge shop,and the last boats leave early. So if you are staying on the Island, the streets empty out around 7:00 p.m. instead of 10:00 p.m. and you’ll have the place to yourself. There is nothing like a peaceful stroll through the downtown area after the day visitors have gone. At the end of September, sale signs start popping up in all of the awesome stores on the Island. As the weeks wind down, the percentage off goes up. By the end of October when the regular ferry season ends, you will see upwards of 60% off everything from souvenirs to clothing to shoes. It’s a perfect time to get some Christmas shopping done or, let’s be honest here, treat yourself. Mackinac Island is famous for the purple and white of the lilacs during the Lilac Festival in June, but in the fall, the Island explodes with color as the leaves turn every shade of yellow, orange, and red imaginable. Plan your trip now and purchase discount ferry tickets. If you can’t make it this fall, start making plans to visit with us next October and experience the best season on Mackinac Island. Are the boat photo tours that go in each direction for lighthouse tour hoots still operating after Labor Day ? We do have lighthouse cruises departing through September 17th. We hope you can find a date that works for you! Did the vessel cedarville lighthouse cruise as a gift from my family for 75 birthday with my son and grandson Ben, one of your employees. I’d suggest running a reverse route seeing the lighthouses first instead of the leisurely 2.5hours without seeing a lighthouse. I think the leasure part would be enjoyed more for the later half doing the Round Island lights as the Grand finale. It got pretty long but was very enjoyable. The narrator was outstanding. Thank you for the suggestion, Larry. We are looking at this cruise and seeing how we can improve the routing. We are glad that you enjoyed it and will pass along your compliment to Joe Lane, who narrates the cruises. I used to work on that island back in the 80s when I was very young. It was a cool place to be. I always thought about moving there for good, but we’re presently in northern Arizona enjoy the desert life and such.